We began this post series by introducing Google’s material design specification for the latest iteration of Android. Material design represents Google’s attempt to unify design across its many different Android platforms, which focuses on building a flat aesthetic with a 3D tactility. We then went on to explore the implications of this new design spec for the Android launcher environment. Google are encouraging designers to create unique app icons and widgets that fit within their new, unified visual style, through the use of new colour palettes, lighting and shadow. Having explored material design more generally, and in the context of the launcher, we’ll conclude this mini-series by turning our gaze to the internal app environment – that is, how designers can successfully integrate these new principles into app design. Thankfully, this aspect of material design actually doesn’t require that much legwork on the part of designers. 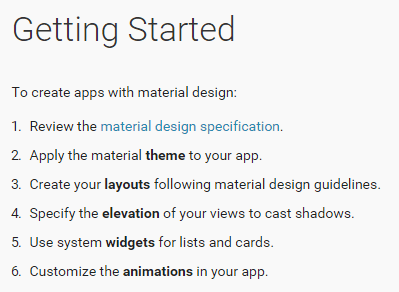 Not only do Google already provide a step-by-step guide for creating apps with material design (see below), but the Lollipop SDK includes a preset, customisable ‘material theme’ for apps. It basically provides a number of stock animation APIs and system widgets that work within the guidelines of material design. However, you can customise more or less every aspect of the theme – from the colour palette to the feedback and transition animations. Thus, what the material theme offers developers is a tangible framework that gives us the freedom to work within Google’s new design ethos, in a way that isn’t restrictive unlike, for example, designing on the Windows Phone platform is. 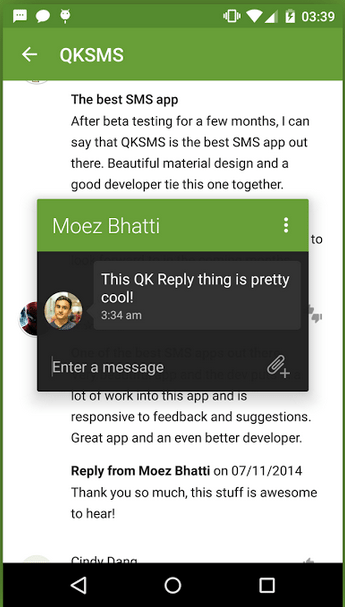 A good example of a third party app that uses the material theme is Moez Bhatti’s QKSMS. Not only does it use the colour palettes and animation APIs suggested by Google, it extends the customisation options available to developers to the end user as well. Bhatti also seems to have gone the extra mile by creating a unique browsing interface which shows your list of threads alongside the threads themselves (rather than just a one/two-line preview). This creates a more complex in-app functionality, which serves usefully to distinguish the app itself from the ‘quick reply’ feature that utilises card-style popups. Cards aren’t unique to Lollipop – they were introduced in 4.0 (Jelly Bean) with Google Now. If you’ve used Google Now before, you’ll know it works by collating your Android/Google activity (in a suspiciously omniscient way) and providing you with ‘cards’ of information it thinks you will find relevant. Users can swipe the cards ‘away’ if they don’t think the information they’re being given is relevant, which in turn alters the sorts of information the programme targets you with. Many people are dissuaded from using Google Now because of its data reach, but Google are now encouraging the ‘card’ format’s use in third party applications. The material theme gives us a lot of options for easily creating cards in apps, and Google have once again extensively documented how this can be done. This is a very straightforward concept with a lot of potential functions, especially when content is structured like a list (think reader apps). Again, there are enough customisation options available that you can make cards unique. One of the biggest criticisms – and celebrations – of the old Android system was its customisation. The operating system is so easily moulded by developers that, depending on the company making the phone, a manufacturer-specific iteration of Android can be unrecognisable from the vanilla OS. This has been a double-edged sword – it has allowed Android users to make their smartphones ‘theirs’ in a way that the more restrictive systems of Windows and iOS don’t. Android’s dominance in the smartphone market is perhaps due to its developer and user-centric ethos. However, what Android always lacked from a design perspective was a coherent design narrative or guide. You actually have to go to some lengths to make your Android phone feel consistent across its different features – and while this might be a selling point of Android, it can lead to a feeling of incoherence as new apps and software are developed. With material design, Google have given developers a means to create unique, highly customisable apps that fit within a wider – but clearer – design framework. As Lollipop matures, it will be interesting to see whether Google are able to retain the fine balance between giving users and developers a myriad of different customisation options, and unifying design across the platform as a whole. The web should be fast!